Police say they will take “robust” action against “mindless” vandals after reports of anti social behaviour at Caistor Sports Ground. 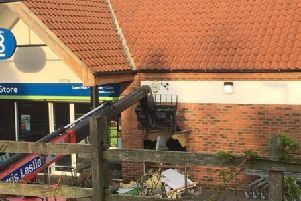 In a statement on its Facebook site, Caistor Neighbourhood Policing Team said fires were being lit, bottles smashed and people were reported to be jumping on the top of sheds. The statement said: “Anyone found responsible for this shall be dealt with robustly. A West Lindsey District Council spokesman said its anti-social behaviour team plans to meet with Caistor Town Council, Positive Futures and Lincolnshire Police, next month to work out how to tackle to problem. Community beat manager PC Chris Bell said an incident of anti-social behaviour on the sports field had been reported via 101 on Saturday, September 12. He said: “We are upping patrols and passing attention to the site overnight and at weekends. And Caistor In Bloom chairman Deborah Barker said members would be happy to work with the offenders on town projects. She said: “In Bloom isn’t just about flowers, it’s about being a happy and safe place to live. “Anti-social behaviour is something we would be concerned about. “We want to try to discourage that. “Vandalism happens because people feel out of the community. Caistor Town Council is in the process of getting CCTV for the sport ground - however it is not as a result of this reported anti-social behaviour. Town councillor Alan Caine said: “The authorities are aware and dealing. West Lindsey councillor for the Caistor and Yarborough ward, Owen Bierley, said: “When you come across problems like this, it’s usually down to very few individuals. “From time to time each of our communities have similar problems. Police are urging residents to report any incidents of anti-social behaviour immediately. l Call 999 if a crime is in progress or the non-emergency number 101 if you believe such activity has occured..